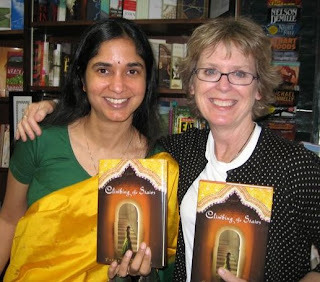 Padma Venkatraman, author of CLIMBING THE STAIRS (Putnam, April 2008), has been on a whirlwind blog tour. Today she joins us on the Fire Escape where I'm honored to host her final stop. Before we start, though, I have to confess a bit of personal history related to this interview. Françoise Bui, editor of Secret Keeper, my forthcoming book from Random House, called recently. Just before we ended the conversation, she shared that she'd read a novel with some similar themes to my own. It was called CLIMBING THE STAIRS. Apparently, Padma and I had both featured an Indian girl who moves into her joint family's home, created a romantic interest with a boy upstairs, and delved into the loss of a father. "But they're very different stories," Françoise told me. Despite those editorial reassurances, I began Padma's novel with trepidation, worried that our books might be too similar. And hers came out first, darn it. And got bundles of starred reviews, too. Would I have to convince the gatekeepers that my book was done and off to press before I read CLIMBING THE STAIRS? Would I become the next South Asian American writer accused of plagiarism? How similar were the two books, anyway? Okay, now are you ready for some enlightening Q & A with Padma? Here goes. You were born in India and lived there until you were 19 years old. Now you’ve lived here for __ years, and you’re becoming an American. So, tell us, Padma, where is “home” for you? I am certainly American – as you can tell by my leaving that second blank blank…I’m a lot older than people guess when they see me! I became a citizen just over a year ago – when people ask me why, I tell them it’s because America has the best Public Library system in the world. I mean it, too. Where else can you find so many wonderful free libraries filled with friendly librarians? Home…I told Betty Cotter of the South County Independent recently that I carry a lot of homes inside me, and I think that’s true. India is a home, but so is America. And at times I have felt “heimweh” for Kiel, in Northern Germany. And when I read Harry Potter, I remember my days at Brockwood Park School in England. So, Hampshire (in the UK) is one of my homes, too. And my accent is a hodgepodge. Right now, of course, Rhode Island is home most of all. It's wonderful to have many homes and love them all. I love how the book provides a fresh take on WWII for teens -- not many people realize the turmoil and divisions taking place inside India during that time. Why do you think that it's important for young people to read stories set in other times and places? I think it’s important for them, for all of us, really, to read stories set in other times and places so we can appreciate diversity – but also so we can come to an understanding of what we all share as human beings. So that we can be fascinated, entranced, even, by a location or time that seems exotic. So that we can see that however exotic the setting of a story is, there is a fundamental human thread that ties all our tightly stories together. Amen, sister. Some of the perhaps unfamiliar (to many American teens) "isms" introduced so cogently in the novel include Mahatma Gandhi's view of pacifism, internal differences in Hinduism, and the impact of colonialism. Could you sum up for us the dream response of a reader who knows little or nothing about India’s history and culture? Climbing the stairs by Padma Venkatraman is a novel about a teenage girl, Vidya, growing up in India during World War II. Vidya is very free spirited and does not act as a lady like her family would hope. She dreams of going to college, but when a family crisis hits, her future plans are jeopardized. Venkatraman portrays the highly individualized Vidya in a way that the reader can immediately connect to her. The plot is thrilling and I found myself having a hard time putting the book down. I enjoyed how this book has a lot of very interesting historical and cultural information. At many points in the story I was left amazed at the cultural bridge between the United States and India. I could not believe what the treatment of women was like in India even as last as the mid 1900s. This book illustrates the struggles of India as a country and how war can tear families apart. While many families fought nonviolently against the British occupation that was going on at that time, others chose to fight alongside the British in the quest to defeat Hitler. Vidya finds herself in a family that is torn between the two. This is one of the best historical fiction novels I have read. The balance between plot and history makes it so enjoyable. I would most definitely recommend this book to any reader, especially one who loves historical fiction. Now that review was and is a dream response come true!!! So lovely. Now let's move to the journey of getting the novel published. What was a high point? A low point? High point – the sunny summer day last July, right before our wedding, when my agent called to say “Putnam-Penguin bought your novel” and I yelled so loudly that our neighbor stopped pottering about in his yard to look up and see what was going on. Looking back on it now, I suppose I could have been thrilled she liked the book, but I really wanted to publish the novel in America, my country of adoption, and not in India, where my previous work had been successful. And she was telling me in her opinion (which I greatly valued) it wouldn’t do well here because of what it was about. That was really tough because I wanted to tell Vidya’s story to people in this nation. And if the story wasn’t going to be heard but the writing was at least sort of okay, then what could I do? (As my dearest husband pointed out, I could send it to another agent). Where the novel started. At first, the novel started with Vidya already in Madras, if I remember correctly. As my wonderful editor pointed out, I needed to describe what Vidya’s life was like before she moved – and the chapters I usually read aloud from nowadays didn’t exist in the first draft! I often compare my editor to my high-school and university athletic coaches – I used to participate in ‘high jump’ and, like a sports coach, my editor kept raising the bar (which I’m glad he did). When I was writing it, the Protest March chapter used to keep me awake because it upset me so much and it was frightening to envision it. Now, I am kept awake at night because of the sadistic streak I have that I’ve come to be aware of because of the novel. At least two people have actually cried proper tears at two of my readings, and that fills me with such elation that I can’t sleep at night. And oh how wonderfully nice I feel toward these listeners/readers! Then, I write to my editor “hey, someone cried when appa was bashed up, yay, yay, yay!” After that, I feel pretty ashamed of myself and I keep awake thinking “Padma you have become a rotten, rotten person.” But I get up in the morning and laugh because it is all rather silly rubbish how you can go up and down like a roller coaster based on how people react to your work. a) readers see the current relevance of the characters’ central conflicts while enjoying the dramatic setting – the unique contrast of a time and place when/where the world was experiencing World War II and a nonviolent liberation movement. b) savvy marketer’s take…that I’d have to learn from more experienced authors such as yourself! I have so much to learn about marketing…I’m right on the bottom step there…a lot of stairs left to climb! On a related note, I have to say that I’m deeply, deeply grateful for all the success we’ve had already with the novel, such as the starred reviews in Publisher’s Weekly, Booklist, and VOYA, and the great reviews in Kirkus and School Library Journal. There’s a lot to be thankful for during my debut novel’s “birthday” month – including this wonderful blog tour, hosted by so many dear author friends! I’m so honored to have the grand finale of this tour here on my blog guru’s site! Wow. A blog guru is way better than a love guru, so take that, Mike Myers. Okay, here's my last question: What's next for Padma Venkatraman in the realm of children's books? A picture book for elementary school children that I worked on a long time ago for August House, called The Cleverest Thief will be out this November. But that’s published under the name “T. V. Padma” because it’s for a younger readership - there’s my schizophrenia for you…I used to write for the younger audience, and my books for them, mostly published in India, were written as T. V. Padma. So perhaps the correct answer to your question is that when she’s not learning how to climb the blogging stairs, Padma Venkatraman is revising her next YA novel, ISLAND'S END, which is slated for publication by G. P. Putnam’s Sons (Penguin) in spring 2010. Can't wait to read it. Thank you, Padma, for spending time with us on the Fire Escape, and for creating this lovely novel.